Ferrite Pot Magnets are useful for corrosion resistance, marine, low cost and higher temperature applications. Variants are available with ferrite magnetic core, with threaded socket, countersunk or cylinder bore or external thread. 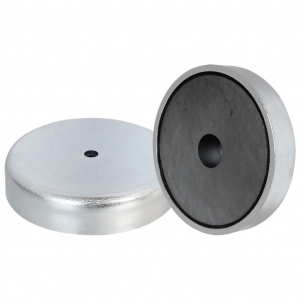 Ferrite holding pot magnets, also called ceramic pot ferrites, have a mild steel casing over a Ferrite ring magnet with a round central hole for fixing a bolt, rivet or screw, through for attaching to non-magnetic surfaces. 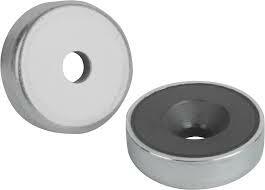 With no moving parts the Ferrite pot requires no maintenance beyond ensuring the magnet is clean and has a long life. Hangseng Magnetech ferrite pots are commonly used for general holding and attaching applications on to a wall, ceiling or other surfaces. 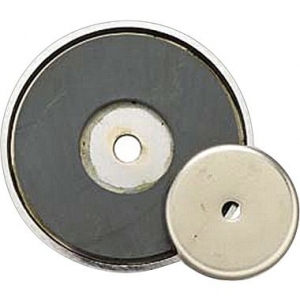 Our ceramic holding magnets are the best option for those who require a good value magnet with a strong pull force. Please contact us by E-mail usor call 86-574-27667267 for any size and design you need, if you require any additional information about our Ferrite Holding Pot Magnet’s uses and applications.